Just listed - check out this sleek 92' Riva yacht for sale in Florida! 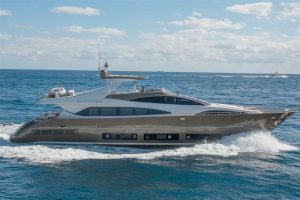 : Atlantic Yacht & Ship, Inc.
Just listed – check out this sleek 92′ Riva yacht for sale in Florida! Word from Joe Marino brings word that he has listed a deal on a 92′ Riva yacht for sale. In the first place, this 92′ Riva yacht is known as “SEA SIX.” In essence this boat is in excellent shape as it was only launched in 2010. Of course this 92′ Riva yacht was built to US specifications. Furthermore, this is the only 92′ Riva currently available for sale in the United States! As can be seen, this 92′ Riva yacht has a head-turning bronze hull. This color compliments her sleek lines and styling. Additionally, she had a recent refit which included a complete exterior paint job. You will love her full teak walk-around decks that take guests from the aft deck all the way to the bow. In fact, her aft deck features a large cutom table with forward-facing seating. Correspondingly, this table accommodates up to eight guests which also enjoy four staterooms. Together with her twin MTU diesel engines which push her up to speeds above 20 knots. For more information on this beautiful used 92′ Riva contact Joe Marino today!